The act of defending oneself with a firearm is not a skill you are born with or taught as a kid. Since it doesn’t come naturally, self-defense must be learned by conscious repetition and instruction. Drawing, aiming, and firing a handgun is a motor skill. Like other actions requiring coordination such as bicycling or swimming, skills related to shooting can be learned and honed through repetitive practice. Repeating the same movements over and over helps solidify the muscle-to-mind connections and partially automates the process. With enough practice, gun handling movements can become almost unconscious. Have you ever automatically put on your seatbelt to move your car across the yard a few feet? It wasn’t necessary, but the automatic part of your brain took over from habit. This type of automatic mind response can be dangerous if you allow it to take over your perception of self-defense situations. Unlike motor skills, you don’t want your mental assessment of threats and self-defense situations to become inflexible. If you train as though you’ll always be approached and threatened in the same manner, you’ll seriously limit your ability to act in real time to a legitimate threat. Any preconceived notions of how things “should be” will add several seconds to your response time. You’ll have to first realize that events aren’t going according to your preconceived model and then adjust yourself in order to respond to reality. This lag in response time can give an attacker an advantage. 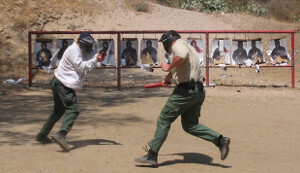 Self-defense training is mostly action, usually involving reactions to threats. Inaction can be deadly, but so can taking an incorrect action. It would be a mistake to train yourself to draw on a threat no matter what because some threats are far enough away or simply don’t warrant deadly force. Fine-tuning your ability to quickly assess threats in real time and responding appropriate by calling on your learned motor skills is something that takes dedication and practice. Learning these skills will allow you to respond appropriately to threats without losing ground or reacting too aggressively. In the real world, remaining vigilant 24/7 and never being surprised or caught off guard is impossible. None of us has eyes in the back of our heads and like it or not, many situations that call for you to employ deadly force probably will start off as a surprise. Of course, it’s always important to remain vigilant and aware of your surroundings. It does help you anticipate many problems that would otherwise sneak up on you. What is important to keep in mind is that many self-defense situations can escalate from your eating an ice cream cone to having to defend your life in a matter of seconds. In a life-threatening standoff, there is a good chance guns will be pointed at you and there may be more than one shooter. Getting your own gun out, if someone is already pointing theirs at you, will probably get you shot no matter how fast your draw is. This probability is of course, compounded if there is more than one firearm pointed in your direction. At the end of the day, you’re primarily concerned with not getting shot. This is why you carry in the first place — so you can shoot before someone shoots you. When it comes to movement and agility, your physical conditioning is also a key factor. Being in good shape means you can run, jump, and get away from danger faster than if you’re overweight and in poor health. Also as you age, your senses can gradually dull. This can happen so slowly that you aren’t even aware that your vision and hearing aren’t what they were in your twenties. Make regular hearing and vision checks a priority. If you need vision correction, wear it. The same goes for hearing aids. Having your senses sharpened up means that you can detect threats earlier and respond effectively.